Every year, an average of 35,000 travelers visit Tanzania to climb Kilimanjaro. For us, it’s a once in a lifetime experience with the hopes of reaching the summit of the world’s tallest freestanding mountain. We save up months or even years for the trip, you research the right kit, you train hard. At the end, we look back fondly on the Kilimanjaro porters who take on immense physical hardship to get us to the top and make our dreams a reality. And without them, no expedition on Kilimanjaro would have been possible. For the porters, they wave off their guests once their climb is done and start prepping for their next expedition. There are two climbing seasons in the year, in total spanning 8 months and porters are considered incredibly fortunate if they are able to get work to climb 16 times in a year. At minimum wage and tip, on an average 6 day Kilimanjaro climb, one of these porters will be making approximately the equivalent of US$1,090 (that’s just £825) a year. Yet most porters will support their entire family for the whole year on their income from these climbs. There is huge pressure for them to accept work at less than minimum wage and proper working conditions in order to earn a living. But who is looking after them? Their needs? Their rights? 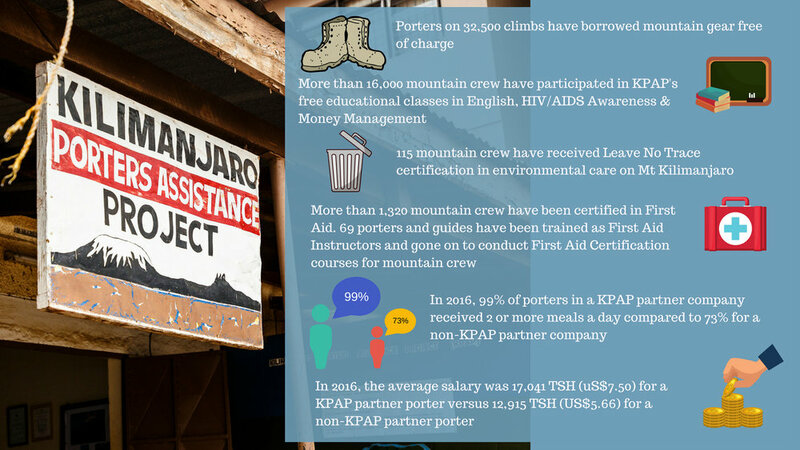 The Kilimanjaro Porters Assistance Project or KPAP, have been working hard to change this. They have been working with the porters and partnering with responsible travel companies as part of the KPAP Partner Programme, to improve working conditions and raise awareness to travelers coming to Kilimanjaro that you and I have a choice of whom we select as climbing companies to ensure that their crew are not being exploited. This has already impacted over 7,000 porters and is making a huge difference to their lives and the lives of their families. And we at Three Peaks Africa want that to continue. As a not-for-profit organisation that runs on a volunteer basis, KPAP have struggled over the past few years on a very tight budget to keep operations going to do their amazing work. With your help this crowdfunding campaign will help them to change that. Three Peaks Africa are looking to help fundraise £14,805, to support KPAP to continue their good work on supporting the porters on the mountain. To continue the running of things such as the KPAP Partner Programmeand the running of the Clothes Lending Programme accessible to all porters, not just KPAP porters, who can’t afford proper climbing equipment, to borrow clothing free of charge so that they are safe on the mountain. Your money will also be going to restart essential training programmes such as Leave No Trace and First Aid for 175 Kilimanjaro Porters that had to be stopped in recent years due to a lack of funding. We are calling on every climber, tour operator, travel agent, changemaker and ordinary people, just like you and me, who love travelling and doing amazing things, to help. Help in our efforts to make sure that all climbing companies are treating their workers fairly. TOGETHER, we can give local Tanzanians a decent chance and a voice. A fair playing field to earn a decent living.